The mosquito-borne illness yellow fever has been found in further districts in Brazil, including the state of Sao Paulo where 20 cases have recently been identified. Now, almost all of Brazil is said to be at risk of the serious viral illness. Although the WHO have identified a handful of states where yellow fever has still not been found, in practice all travellers should be vaccinated before travelling as it is very likely that journeys to Brazil will now include yellow fever areas. So far, only one person infected with yellow fever in Brazil has been shown to have subsequently carried it to their home country: this solitary case was diagnosed in the Netherlands two weeks ago. With mosquito borne illnesses, it is often a fear that epidemics of disease can be transmitted to other parts of the globe when returning infected patients are bitten by local mosquitos, which subsequently also become infected with yellow fever. Whilst there is no chance of this occurring in the chilly Netherlands, if the patient was a resident of a country in the tropics, for example, the situation may have been considerably different. Although the case numbers in Brazil are fairly low, because of the seriousness of the infection, the number of fatalities is disproportionately high: although only 145 patients are suspected of having the disease, 20 have already died. Brazilian authorities have therefore instigated a mass vaccination campaign of over 21 million people. Apart from the problematic logistical considerations of such a large programme, there are further difficulties as supplies of yellow fever vaccine have been limited for some time. In fact, a radical solution that is being utilised is for a much-reduced dose of the yellow fever immunisation to be trialled. One fifth of the usual immunisation (0.1mls) will be given to 16 million of the patients, the other individuals receiving the usual 0.5mls dose. There is good evidence from some research that this dose-sparing approach might well be very effective: 4 studies have now shown that the lower dose is able to provoke the same level of yellow fever antibodies in patients as the full dose. Of course, measuring levels of antibodies in the two dosing groups is not the same as comparing the proportion of patients who are protected from the disease – technically speaking, the antibody levels are just a surrogate for the immunity achieved against the yellow fever disease. Simply put, we hope that the similar antibody levels will mean that all the patients will be equally protected against yellow fever. But we don’t know for sure. With 21 million vaccinated patients in Brazil, we may be able to address this point very soon. Cholera continues to cause mass casualties wherever basic sanitation is lacking. Whether following natural disasters or man-made conflicts, or occurring where local public health measures are basic to begin with, poor sanitation allows the contamination of drinking water with infected excrement, enabling the cholera bacteria to be spread to many thousands of individuals. In Yemen, 1 million suspected cases are said to have occurred in the last 10 months causing over 2,000 deaths – the annual global death rate may be as high as 100,000. The bacteria Vibrio cholera, that are responsible for cholera, produces a toxin that forces the cells of a patient’s intestines to start secreting fluid and electrolytes – thus causing a profuse diarrhoea. For most patients simple rehydration with purified water and salts are all that is needed to treat the diarrhoea. If fluid replenishment does not occur, profound dehydration can easily result. When this occurs in the body, vital organs such as the kidneys, liver and the brain become starved of oxygen and nutrients. Multi-organ failure can then follow, often resulting in death. As the treatment of this condition – drinking boiled water with some added salt and sugar – is so simple, many see these potentially preventable fatalities as particularly tragic. Papua has a measles epidemic at present: 800 children are said to have fallen ill, resulting in around 100 deaths. Local reports suggest that 12,000 children are being vaccinated in an attempt to curb this infection caused by the measles virus. In the West, it is easy to forget the global devastation that occurred annually before the use of the measles vaccine in the 1960s. Up to 100 million people were infected each year around the globe, which resulted in more than 2 million deaths and many thousands of cases of blindness. In fact, measles was so contagious that an estimated 95% of all children were said to be infected with the virus before their 15th birthday. Measles is one of the most infectious agents that cause human disease. 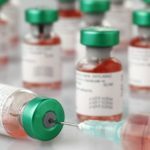 The WHO report that following their global campaign to increase the uptake of measles immunisation, there has been a 79% reduction in the worldwide death rate from this disease since the start of the century. Despite this, there are still occasional outbreaks in the US and European countries as some parents have unfounded fears concerning the vaccine and fail to immunise their children. If the herd-immunity should drop to less than 93%, many fear that a widespread measles epidemic could be re-established. A look into the history books will show us why this is to be avoided at all costs. The much-heralded seasonal influenza has now caused many thousands of cases in the Northern Hemisphere. Particularly high levels have been reported by the CDC throughout mainland USA. In the UK, moderately high levels of flu cases have been reported in England and Scotland, with higher rates seen in Wales. There are signs that although the case numbers are still generally increasing, they are beginning to peak: a decrease in cases might be expected shortly. The predominant flu viruses have been H1N1, H3N2 and influenza B viruses – the same species that were responsible for the Australian flu last year. Whether this year’s influenza vaccination was as ineffective as seen during the Australian experience is still to be assessed.